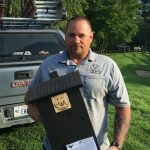 Estate Wildlife Control LLC was established on January 1st, 2010 by Scott Borthwick as a full-time, full service nuisance wildlife control business. Estate Wildlife’s purpose is to provide professional removal and exclusion of nuisance wildlife from residential and commercial properties in New Hampshire and Vermont. Mr. Borthwick has worked in this field on a part-time basis for over 30 years. Prior to 2010, Mr. Borthwick worked full-time in the construction industry in one form or another and owned and operated Borthwick Builders LLC for a number of years. Due to a down turn in the economy and a failure to get any younger, Mr. Borthwick decided to dissolve Borthwick Builders and pursue his dream of a full-time trapping business. Scott started trapping at the age 15 and his first nuisance wildlife job was in 1978 removing raccoons from The Old Belfry Club in Lexington, MA. In 1987, Mr. Borthwick moved to Canaan, N.H.. In 1988 started his first New Hampshire trapline, another dream come true. Since then, he has served on the Board of Directors for the New Hampshire Trappers Association for 14yr.s and as President for 2 yrs., 4 yrs. on the New Hampshire Wildlife Federation Board of Directors, and was honored as “Trapper of the Year” in 2001. Mr. Borthwick also assisted the New Hampshire Fish and Game Department in the writing of the Nuisance Wildlife Control Operator laws for New Hampshire. Due to Mr. Borthwick’s years of experience in both construction and wildlife removal, Estate Wildlife Control LLC has the unique opportunity of providing not only professional removal of nuisance wildlife, but also complete repair to prevent further problems – from repairing or replacing facia, soffits, siding or roofing to securing decks and basements. We also do deer, moose and bear electric fencing installation to protect your property.